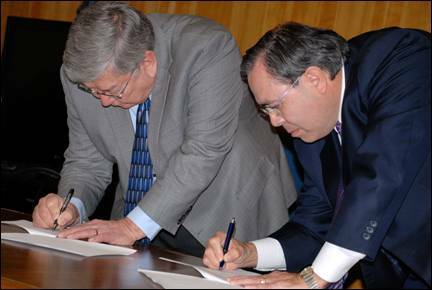 Bill Martin, President of Central Council Tlingit & Haida Indian Tribes of Alaska (Central Council) and Chris E. McNeil, Jr., Sealaska President & CEO are pleased to announce that a Memorandum of Understanding (MOU) was signed on March 27, 2009 between Central Council and Sealaska. The MOU is a historic agreement and strengthens opportunities for shareholders and members of both Native organizations. The intent is to provide business opportunities that will meet mutual objectives, including exploring business partnerships and investment opportunities in the region. Central Council and Sealaska will focus on U.S. Small Business Administration 8(a) federal contracting and mentor/protégé programs, renewable energy projects, labor force training and deployment, tourism and community infrastructure development. “The board of Directors, Sealaska management and our subsidiaries are working together to increase our economic activity in Southeast,” said Sealaska Director Tate London. “This MOU aligns well with that vision and is an important step that will build off the collective strength of Sealaska and Central Council,” said London. Presidents Martin and McNeil’s vision is to jointly develop enhanced revenue for the Tribe and Sealaska through future partnerships. Sealaska and Central Council will initially focus on the opportunities available by passage of the American Recovery and Reinvestment Act (stimulus package).